Another Facebook update and this one can send brands into a tizzy. You have a whole lot of re-learning to do. The guidelines get updated as we speak. Some content was last updated on February 29 2012, and some other on March 6 2012. We have tried to simplify it here. Read on. When a new interested and potential fan lands on a brand page it is currently a Welcome page with a ‘Like Us’ call for action. 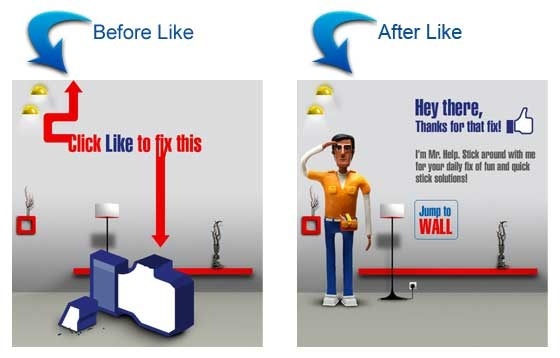 Once the user hits `Likes’, he is auto-directed to the next landing page, or the wall as per a brand’s preference. 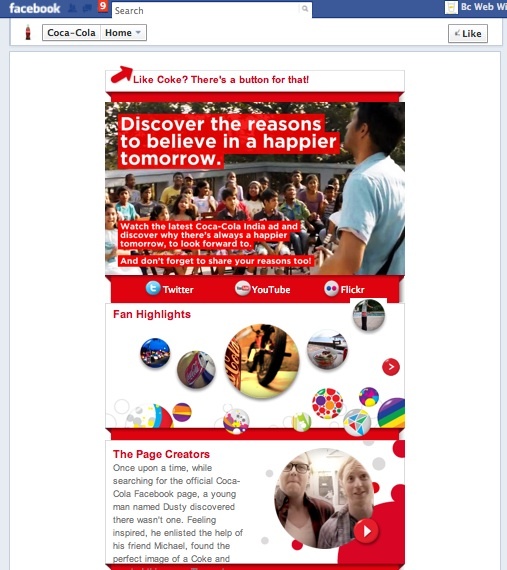 The new Facebook Timeline brand page does not have a Welcome landing page option. This might become a single largest deterrent to how many new fans you are able to generate. Of course only time and new creative means will actually determine the nature and extent of impact. BC Web Wise has just shifted our own Brand Page to Facebook Timelines. By default, whether or not a visitor has liked your page, they can view your brand’s wall content when they land on it. So not just the header but all the content they can view below it becomes important now. The Welcome page is now replaced with a static header on your brand page. You can put a Cover Photo here. This is the area that can be used as creatively as one can. The key objective should be how you can use it to get visitors to like you and follow you without saying as much, because Facebook Guidelines have strictly specified you cannot have such messaging on the cover photo. So now that we do not have a Welcome page, you may want to use the new header area to do this promotion. The Facebook guidelines (as updated on 6, March, 2012) do not specifically comment on whether you can do this or not. So we can safely assume that a static message talking about an application or contest can be done so long as all the other Facebook guidelines are adhered to. However, the area that needs to now be most creatively used is where the tabs appear. The 135 x 95 pixel jpg file will now become very critical. It is here that you can generate a fan following as the user has to ‘Allow’ your application to access their profile to use the application. The earlier vertical update of latest status messages had its own advantages of being simple to view and follow. The new page layout, now allows for better graphic display, it does look much better visually therefore it encourages multi-media in the form of videos or photographs. So get ready to use your image and video bank. There are more features that are still to be tested thoroughly. 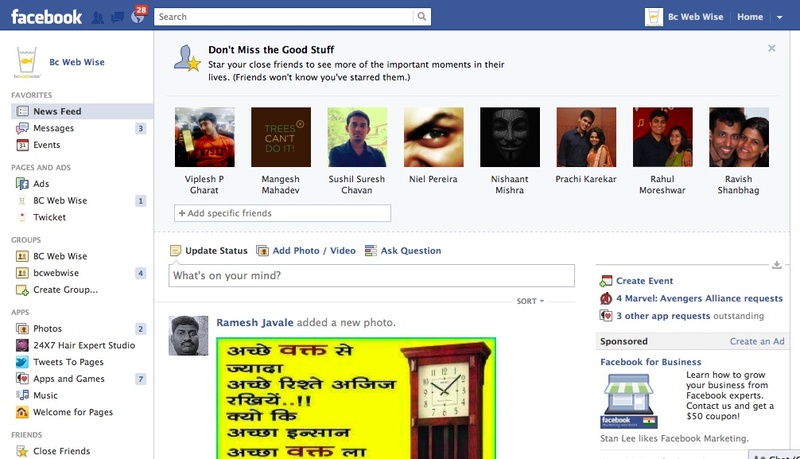 There is an option to ‘Highlight’ certain status updates or wall posts, so they are larger in size than the others. There is an option to ‘Pin’ certain posts so they will stay on top of the page. There is also an interesting feature from a user perspective. When they visit your brand page, they can see the significant activities or post around your brand made by someone from their friends list. This is good for brands with existing followings that are large. But those that have fans that are fewer in number the number of such interactions may be very less or non-existent. The key thing we do not like about the new Facebook Timelines for brands is that it does not allow you to prompt fans to like you, and second that it does not have a rich-media option for the cover photo. But as change is a constant Facebook should be addressing some of these concerns that will benefit its users and advertisers. The brand pages on Facebook are going to change on March 31, and that is very little time to try and test everything on a new page particularly with guidelines that are getting updated as you read. So get set go!